GE13 has the most highest voter turnout history of Malaysia that is 80% (close to 13 million Malaysians voted). This shows that the rakyat wants to have a say on the direction and leadership of the country. The GE13 election result came in very late. (especially on Pakatan previously controlled states) I had to went to sleep with the hopes that a fair & clean election will enable Malaysians to democratically select their government of choice. 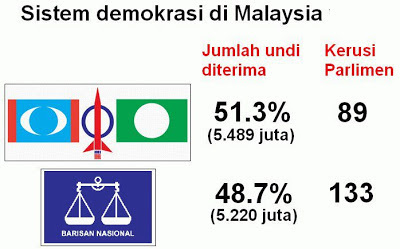 Pakatan Rakyat was unofficially leading in most states. Amidst Facebook postings and videos of various non-Malaysians trying to "vote" on our behalf and a lot of magical blackouts during recount that turn the tide to the other side. A lot of storys of ghost busters. Even though Pakatan has more support than the govt in terms of number of voters (see above), but because the way the Parliamentary seats are divided, any party can win more seats without exactly winning more voters. There are some seats that have total voters like ~8000 (rural) while some seat have like ~50,000 (urban) eligible voters. SO the NO-brainer is actually targeting those many pockets of rural seats where information, new media is not easily accessible. Winning a rural seat of 8,000 is the same as winning a seat at urban area of 50,000, where in actuality the "majority" of voters are there. That is why rural Sarawak & Sabah is the fixed deposit of the government. What really disgusts me is the word/term "CHINESE TSUNAMI" for this GE13 after the winning party announces their simple majority win. It is very derogatory and discriminating , not to mention bordering racist. This implies the Malaysian Chinese are the ONLY ones supporting the Pakatan Rakyat, because we are "deemed" ungrateful towards the current government's contributions, trying to take over the country, etc. WTF, I gladly throw my vote behind a non-chinese candidate that can take care of all Malaysians regardless of creed and religion. I firmly believe many chinese will do so too. 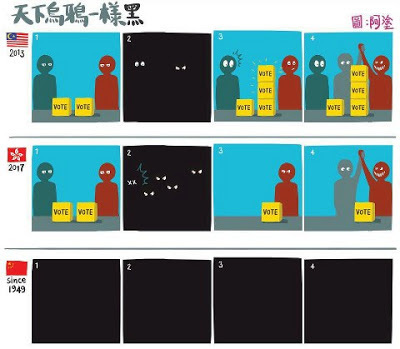 Well this is the typical tactics employed by the current government to incite fear,bias & hatred towards the Chinese and divide the people once again into the racial lines. So much for the 1Malaysia theme that is touted like a mantra. So calling a "CHINESE TSUNAMI" for Pakatan Rakyat's increased support from the people is a blatant discriminatory. Nevertheless, today is a day of mourning. 1. On the note about the "Chinese Tsunami". This will be all over the papers tomorrow. At the time of me writing this, PKR and PAS together won 44 seats, while DAP won 36. Overall BN has 129 with 13 seats still being counted or recounted. This time BN blamed its losses on the "Chinese Tsunami". 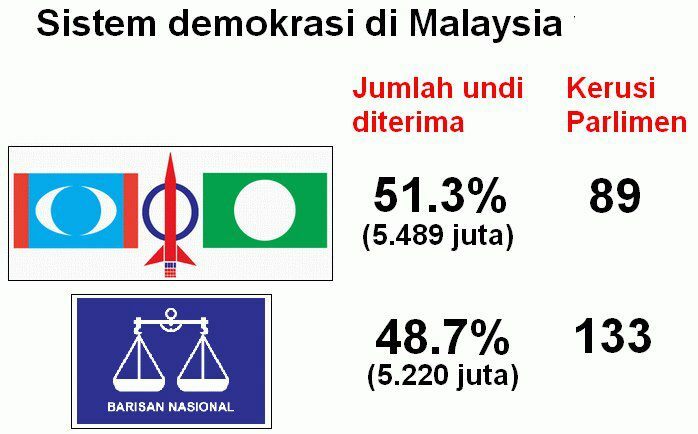 The numbers meant that the malays did vote for the oppositions too. There isn't enough chinese in the country to carry the seats won by PKR and PAS. The fact is actually that the chinese made a resounding statement in not voting for MCA and Gerakan. Which simply means that racial politics is slowly dissipating, and that people are gathering around bigger issues then just race. I do believe that BN sees this. In the statements made by Dato' Seri Najib, BN is strategically moving towards a moderate right stand, and the overwhelming lost of Perkasa, MCA, Gerakan, and its component parties sends a clear message. The extreme racial right wing is losing its shine. 2. On the call for unfair electoral process. This will be hard to prove. Very hard indeed. However, it is important to note that in the seats where the opposition wins with an overwhelming majority, no postal, ghostal, nor electorial manouver could stop it from winning. This is what the opposition needs. An overwhelming win. In many seats in fact the opposition did win convincingly. It came back stronger then before, and the outcome is clear. The opposition wins the urban seats, and has the middle class as its voting base. GE14 is about retaining this base, and coming back with a clear offering for a broader audience. BN has Sabah and Sarawak which is a huge base for its parliamentary seats. When PR lost several of its Kelantan, Selangor, and Perak seats it created a clear path for BN after that. PR needs a strong agenda. Just hating BN, and crying foul over the negative issues isn't enough to attract the moderates. A great strategy would be for PR to form a proper coalition, one logo, one agenda, and a concerted vision. There were enough cracks in the alliance that allowed for the BN campaign to squeeze through and divide the voters. I've always wanted economic clarity, and I don't think I am alone. Yes, I don't like corruption, the lack of press freedom, and the arm twisting tactics, but we also need to know that we are not jumping into the lions den when the voters cross over. A new line up of leaders would help. The LGE, Rafizi, Nurul, and Khalid combination will go very far. The Rakyat is not racist. In this I believe. However, they still need to know that they are protected. The coalition needs to make a clear proclamation that the Special Privileges of the malay is intact. It also needs to clear the air on hudud. Once and for all. 3. On moving forward. Together. I saw a lot of facebook pages turn black. I disagree. We all love this country. We worked hard to fight for change. And working hard for change doesn't mean that it ends when you lose. In fact it begins when you lost. Malaysia has a lot of potential. Please. Don't say you want to leave the country. Please. Don't say that we're run by communists. Please. Don't give up on the land that we share together. Instead, if the call for a better country is sincere, PR supporters should rise in support of making the country greater. There is much to be done. The internet is still a great platform to bind the same belief system. Used correctly it will bring the masses. The world didn't end. Malaysia didn't end. In fact as oppositions PR has done more for the country then it gives itself credit. And the results are a strong mandate from the people. It did better then before, and PR should take the people's vote seriously. I understand the pain. It still is a lost. But losing gracefully means that you get to play again. And next time, with the grace shown, people will remember. I disagree with Dato' Seri Anwar's call for an unfair election. It probably was, or wasn't. It doesn't matter now. All that matters is that we the people shall benefit from the promises made, at the federal and state level. PR won several states. It has promises to fulfill. Work to do. If PR is able to prove that it is a worthy alternative, then perhaps in time, the rakyat will agree. I know that I have made many posts that leans left, and tends to critic the ruling party. And I would have joined in rejoice with PR had it won. I would have hoped that it would bring order to the way of life and the way of work in this country that we all cherish. But perhaps, PR needs to work harder in convincing a lot more people that it isn't just about righting a wrong. It needs to join the moderate middle, tone down, stay the course and share with the people what it is all about. It has won the hearts of those who doesn't want BN, but it has to earn the mind of those who doesn't believe in PR yet. Let's get back to business, work hard, and pray for peace. There are five more years of nation building to do and god willing, this may have a different outcome next time. Perhaps for a party that has a clear agenda of what it is all about, and one that shows the country that it will benefit from its leadership. A reply to the GE13 post. 1. The real winner is the one that won the battle it fought for. I wrote this post last night, and after riding the roller coaster results coming out, I felt that the opposition won. Yes PR won resoundingly. The mandate is clear. The Rakyat wanted a strong alternative, and the Rakyat voted for it. The dent on the majority is growing. As a result PR actually won more seats, and if you got to watch the announcement made by BN you don’t see a face of jubilation. You don’t see a face of satisfaction. You see a face of relief. You see the face of a team that had to fight very hard. Which I am sure they did. PR brought the fight to the polls, and the people have responded. They voted for PR in droves. More then they did in the last election. We today evolved to a bi-party system! PR got us this. PR won this for the people. Now is not the time for haters. Now is not the time to give BN what it wants. Giving chaos and cursing away on social media simply belittles all the great effort that went into making this result possible. I am sure that there are many tired people out there. And they should take a well-earned rest. I thank you for your patriotism and nationalistic sentiments. And looking at the results, I am sure many more feels the same way. For the typical social media trollers, extremist, haters, cursers, and negative commenters I am sorry. We can’t help that you are the way you are. Maintaining social media decorum is what makes this place interesting. I thank the many that defended this in my absentia. We don’t need hate. It is ugly and does nothing but makes you sick. 2. The future is promising when we know where we're going. As for not being a racist, I don’t apologize. I don’t believe that we gain anything by making something we don’t get to choose as a way to decide who benefits and who doesn’t. The Chinese were born Chinese, and so were the Indians, but they were born here. Here in Malaysia. And we all know enough Chinese and Indians that loves this country. Why should we deny them the right to love Malaysia as much as any Malay? Why should we deny the rights of every Malaysian, to make Malaysia better? The Malays need not worry of its special privileges. It is constitutional, and it is something meant to assimilate not alienate. I write for the pleasure of it. So I get to express an opinion that is not paid for. There were suggestions that perhaps I should be a journalist. However, I worry about the state of journalism in this country. A balanced and fair view is hated by both polarized masses, and ends up being burned from both ends. I do hope to see a free press. Of all the issues that I have with this nation, it is the fact that we use the media to manipulate the minds that worries me the most. We need to respect the people for their ability to conclude, and not just put up a story for them to consume. A little about the electoral unfairness we face. Admittedly there is much to be desired in the way we conduct our election. However, in seats that were contentious, PR won. LKS won. DSAI won. LGE won. Nurul won. Rafizi won. Khalid in Bandar Tun Razak won. Khalid in Shah Alam won. In fact in many of the hot seats, more opposition won then BN. PR does need to work harder at bringing out candidates that the people will vote for, and there is no short supply of this. There are many more Malaysians that Malaysians relate to. There are many more Malaysians who want a better nation, then a crooked one. PR needs to win both the hearts and the minds of the masses. The heart got PR where it is today, now we need the mind to sustain the journey moving forward. 3. The journey to an ideal isn't won, it is a way of life. PR should not have an attitude of - if you’re not with me you’re against me. Many supports PR. But many need to love PR too. It is hard to love a cursing hater. Tuning down and being focus on the issues and how to address it brings in more supporters, then pointing fingers and crying foul. We got it. We’re with you. Now please, do give us a reason to stay. Finally, about GE14. I know it feels like it is a long way away, but the opposition should use this time to widen the gap, and deepen its support and not incite hatred. There clearly are a lot of voters for PR. Postal or ghosts not withstanding, PR beats them all in many seats. Retaining this seat is about showing the people that there is a better way. A better alternative. And perhaps many more will agree the next time around. I am no politician, nor do I profess to want to be one. But I am Malaysian. The next few years is about galvanizing this support in making a better Malaysia. One that we all call home. One that we all can be proud of, regardless of what party we support. One Malaysia. Let’s make it real. It is home after all. My final note: Don't give up fighting. 1758. Should be continue fighting within this 21 days. For next round GE 14, I'm not so sure.